Ranbaxy, India’s largest generic drug manufacturer announced the completion of 20 years in Russia. It is among many Indian players struggling against tough competition from European and domestic drug manufacturers in Russian emerging generic drugs market. Ranbaxy, which has been operating in Russia since 1993, has grown to become one of the largest players in generic drug segment. The company claimed to secure 15.4 percent market share in the represented segment (IMS, May 2013). Today Ranbaxy operates in 56 regions in Russia promoting its products across anti-infective, cold, pain management, cardiovascular, diabetology, central nervous system, urology and dermatology segments. Last year, the company’s popular brand, Faringosept was selected as the People’s brand of choice. Ranbaxy has been exploring opportunities for manufacture localisation in Russia since 2006 when it was in talks with one of Russia’s largest generic manufacturers, Akrikhin. However, the deal did not work out as the price of $110 million for a complete takeover of the Russian drug maker seemed too high for Indian counterpart, industry sources say. They add that back in 2006 Akrikhin required investments of $15-20 million in modernisation, therefore Ranbaxy probably decided to look for another investment strategy. In 2007 Akrikhin established a partnership with Polish generics manufacturer Polpharma that acquired a majority stake in Russian company later in 2011. 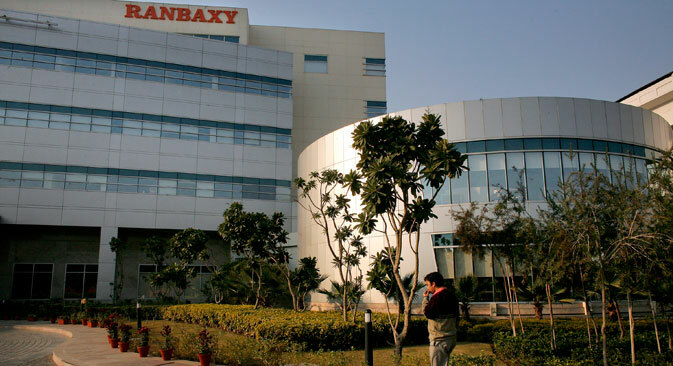 Till now Ranbaxy unlike other Indian players has not yet announced any plans for establishing manufacturing facilities or a joint venture in Russia. In 2011, the company signed an MOU for cooperation in the field of healthcare and medical science with Government of Yaroslavl, one of the centres of pharmaceutical cluster development apart from St Petersburg and Moscow. The Russian pharmaceutical market is one of the fastest growing in the world. Its value is predicted to rise from the present $24-25 billion to $75 billion by 2020, according to various industry analysts. Moscow-based Pharmexpert Analytics and Consulting expects the market to grow 12-13 per cent in 2013 and 10-12 per cent in 2014. DSM group estimates the value of drug import in Russia in 2012 amounted to $14.4 billion, which is 9 percent higher than in 2011. Generic drugs dominate the Russian pharmaceutical market, especially in the hospital sector where generics have more than 80 percent share in value terms. The size of the generics market in 2012 was estimated by various analysts at $3.5 billion making it one of the fastest-growing generic drug markets in the world. Dmitry Raspopov, Consulting Analyst at Frost & Sullivan, adds the market share of generics dropped to 60 percent in 2012 from 71 percent in 2008 in cash value. “The decrease of generics’ share can be explained by the shift in consumption towards more expensive innovative drugs. However, we believe the share of generics will start growing as generics are given preference in government tenders. Moreover, the patents on many original drugs are going to expire and we expect to see the emergence of their analogues,” he says. According to Nikolay Bespalov, Director of Pharmexpert, generics account for 22.5 percent of the Russian market, the share of non-branded generics is only 5.5 percent. In the retail segment, generics account for 15 percent, in the hospital segment about 27 percent while in reimbursement segment only 13.5 percent. Bespalov notes that the share of locally manufactured generics has been growing in the past three years, though imported generics still account for about 73 percent in value terms and 48 percent in real terms. Foreign players like Sanofi, Novartis, Berlin-Chemie, Nycomed, Bayer, Gedeon Richter and others top the ranking of leading players in the Russian pharmaceutical market while there is only one local manufacturer, Pharmstandard, represented in the ranking. Among the largest Indian generic drug makers represented in Russia are Glenmark Pharmaceuticals, Dr. Reddy's Laboratories, Ranbaxy, Cipla, Aurobindo, Lupin and Sun Pharmaceutical Industries. “India like Germany and France are one of the major suppliers of generic drugs to Russia. India’s Dr. Reddy's Laboratories is the largest player in Russia’s market represented here since 1992, its annual growth is 20 percent since 2006,” Raspopov says. Nikolay Bespalov estimates the share of Indian generics in Russian market grew from 2.45 percent in 2010 to 2.87 percent in 2012. Though as a member of WTO Russia will have to reduce tariffs on pharmaceuticals which currently average 5.7 percent and go as high as 15 percent, even after implementation of WTO accession commitments, Russia’s average tariff on pharmaceutical exports will remain at the level of 4-6 per cent. Moreover, WTO principles are not applied to compensation of the cost of medicines or medical products included in packages provided by the state guarantee system of free medical assistance. Domestic pharmaceuticals cover around 25 percent of the Russian commercial market in sales value. The Russian government' s new policies resulted in significant growth of the share of local drug manufacturers across all market segments, industry experts note. According to Pharma2020 strategy approved last year by the Ministry of Industry and Trade the market share of domestic pharmaceutical products has to reach at least 50 percent by 2020. In order to stimulate local manufacturing the government has already introduced and plans to add a series of measures to restrict the access to state tenders for imported medicines. Deloitte experts, however, fear that the share of foreign manufacturers in Russia will not reduce significantly anytime soon. The company's recently published research that was conducted among representatives of foreign companies involved in the production of patented medicines both in Russia and abroad, shows that the Russian market continues to rely on foreign manufacturers. According to 50 percent of Deloitte’s respondents, the share of imported medicines in the Russian market in monetary and/or volume terms will not reduce up to 2016. More than a third of respondents (38 percent) predict a decrease in the share, but no earlier than in 2-3 years. The main reason for this forecast is that the establishment of full cycle medicine manufacturing in Russia by foreign companies in a shorter timeframe is considered impossible. An imperfect pricing system, a lack of companies operating in accordance with the European GMP standard, divisiveness in the creation of a list of vitally important medicines and the application of preferences, and many other issues remain unresolved, Deloitte analysts note. At the same time Deloitte believes that despite all the difficulties, the Russian pharmaceutical market has great prospects for development. Almost half of Deloitte’s respondents plan to introduce new medicines to the Russian market, and a third would like to expand their existing manufacturing capacities or launch new products.